The children of Soso Village that belongs to the Naviti Tikina in the Yasawas will now be able to attend school every day despite adverse weather conditions. This after the opening of a new bridge that will connect the village to the school. Due to climate change and other natural disasters the creek that separates the village from the school was identified as a risk to the children. Around eighty-four students are attending the Ratu Apenisa Primary School. Child Protection Officer, Melaia Simpson, says Soso Village was identified through community profiling. 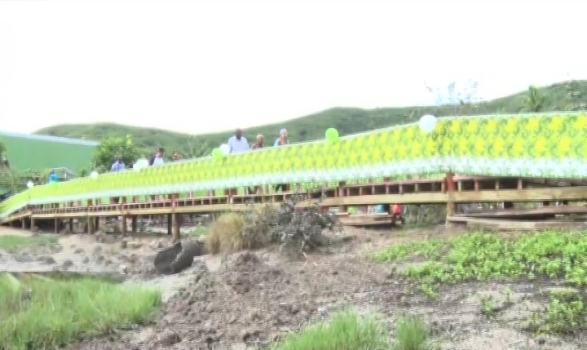 “We worked closely with the Turaga Ni Koro, and we thank the Tui Naviti who resides in this village that he accepted the project so that the bridge could be built for the children." Simpson says the village has managed to retain its traditional values and child protection has been automatically part of this.